View More In Game Hardware - Page 2. 5 Adjustable DPI Switch. 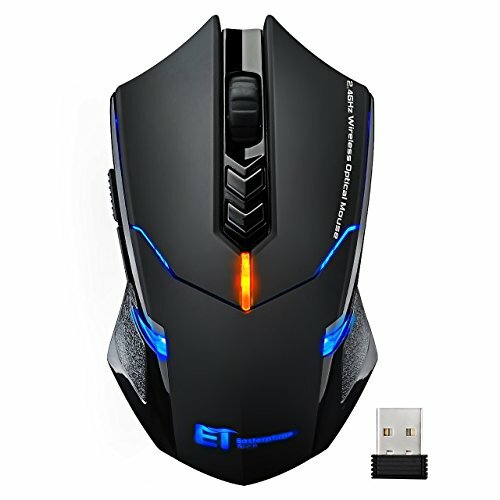 This wireless gaming mouse no need any driver, plug and play. 5 adjustable DPI level ( 800, 1200, 1600, 2000, 2400) to change the speed of mouse freely. Ultra-Fast 2.4G Two-way Wireless Transmission Technology. More secure and precise, the transmission distance can reach to 10 meters(approx 30ft). Advanced Energy-saving Chip. Multi-stage power saving mode, less power consumption. There is a button at the bottom of the mouse, three options: ON, OFF, ON/light. Put it at ON/light, the LED backlight will light up. The cursor performs stably. With strong adaptive surface ability, this wireless gaming mouse works fine on many surfaces. Strong Compatibility. Work perfectly for Windows 7/8/10/XP/Vista/ME/2000/Mac10.x,etc. For Mac OS, the sided buttons are notavailable. Every product from VicTsing will enjoy 45 days money-back and 12-month worry-free warranty.